One of the ingredient to be a successful and a good life insurance agent is 'faithfulness & loyalty'. To be successful one needs hard work and commitment. To be good in the trade, the agent has to be knowledgeable and service orientated. 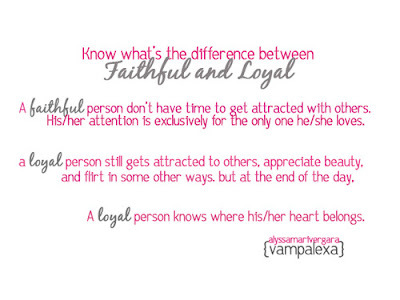 However 'faithfulness & loyalty' is an inborn instinct which most do not have. I have been in the industry long enough to witness not many could stay permanently in this challenging career. One could be very successful in earning from this business, but greed in making more could deviate them to some other ventures which might be even more lucrative. We have some billionaires in town who were once selling life insurance. Yes! They are intelligence and smart but not faithful and loyal. Good agents are honest and sincere but some time with great tempting offers, good agents could easily leave for another company too. There were thousand of our agents who were paid to join our competitors. Yes! Again they are intelligence and smart, but lack the faithfulness and loyalty in heart and mind. At my age who has been selling for 30 years, I am indeed proud to be still selling and serving my clients. I represent them and I remain with the same company when I first started. There were many ups and downs in the industry and the company, but it never occurred in my mind that I would quit. There were countless tempting offers and opportunities given along the way, but silently and repeatedly I reminded myself that I still love selling life insurance. Thanks God. He has blessed me with the right attitude of life... To be faithful and loyal. I certainly stand tall among the thousand of my colleagues. or don't you think that i would try some other things?? or do you ever questioned from you that, is my life is rotating the same spot?? hanging in to a place for some times is hard for me.when the things repeating over and over again it gets my mind upset and i become a man with short temper...but how could you manage that?? When you love something, you will have the passion on it. Talking is my hobby and selling life insurance allows me to talk endlessly with passion. Talking and selling need a lot of patience. And that's when faithfulness & loyalty appear. Most people get upset and irritated quite easily because of emotional. But if you could control to stay calm, then you are special. This title, Keep Calm was written a few days ago and you had read it. See! You had read them but fail to apply them. Can't blame you coz you are still young. I'm sure you will learn.